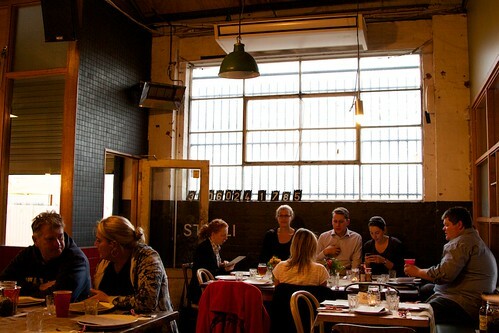 On Thursday night we went to St Ali for the first of 3 texan style BBQ nights organised by Burger Mary, Red River BBQ and the Fringe Food Festival. I bought the tickets almost 2 months ago now and had been sending Gerard a message about it roughly every 3rd day since I booked saying how excited I was. In the meantime I tried to fill my BBQ craving at the Richmond Weekender and a MFWF event at the Newmarket Hotel, sadly neither of them filled the brisket shaped void in my heart. By the time Monday rolled around I was almost bouncing with excitement. Naturally, that’s when disaster struck. Somehow I went from relatively busy at work last week to being completely flat out this week. Flat out in a working until at 10 every night kind of way. Things were not looking good for my BBQ dreams, I was one seriously sad panda. Luckily the meat gods came through for me and I managed to somehow get everything done on Thursday almost exactly at 6.30. I have never been so excited about finishing work in time for dinner. So I sent an email, ran out of my office and high-tailed it down to St Ali with friends Colin Hill and the Prominent Eurasian. When we got there we met up with Gerard who had flown back from Sydney early just for the occasion and we all made it to the door 10 minutes before opening. From the moment we got there, everything was perfect. The hessian table cloths, the checked ribbons tying up cutlery, the country music, the atmosphere, the people and (perhaps most importantly) the food all made it my favourite dinner in a very long time. We all left smiling and saying that it was one of the best things we’ve done in ages, if these people ran a restaurant, I’d put on a lot of weight. I’m going to rave about the food a bit later, but for now I just want to say a quick word about the Fringe Food Festival. This was the first Fringe Food Festival event I’ve been to and I was mega impressed. I love everything about the small scale, casual, fun food events they organise (and how well they organise them). Can’t rave enough. If you haven’t already seen their website, check it out. Oh, there was also line dancing in the lane. I didn’t participate, I’m a little coordination-challenged, and also I might have been sick via having eaten too much. Nice for people who are into that kind of thing though. There have been a lot of BBQ promises in Melbourne recently, and an equal number of shattered dreams and broken hearts. The briskets have been dry, the pork not pulled enough, and I’ve been left with a thirst only a Doctor Pepper can satisfy. Although I had initially jumped at the idea of a Melbourne Fringe Food Festival event serving Texas BBQ, I was getting apprehensive as it approached. I didn’t know if I could handle another broken heart. That, and I had to get there from Sydney. So no pressure. Many moons ago, my bro-BFF and I had a foodtacular trip around Texas. One of the best memories of the trip involved having to lie down in the rental car after gorging myself at Kreuz Market. 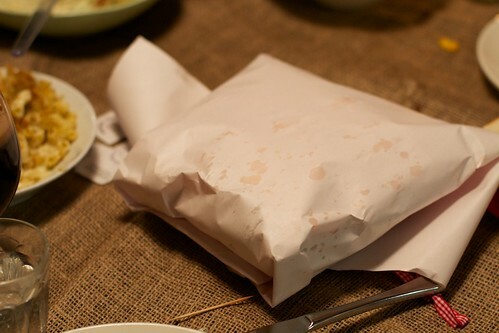 You ordered your meat by the pound, and they served it up in brown paper, with almost a loaf of bread to wash it down. I get the meat sweats just thinking about it. 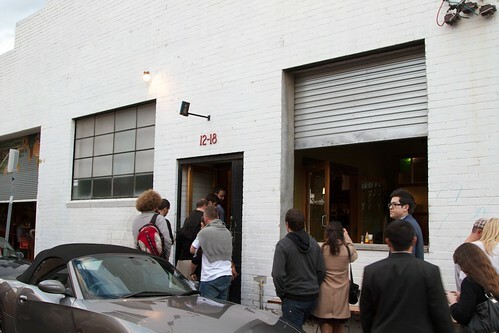 The Texan Flag hanging above the entrance to St. Ali was an indication of the attention to detail to come. 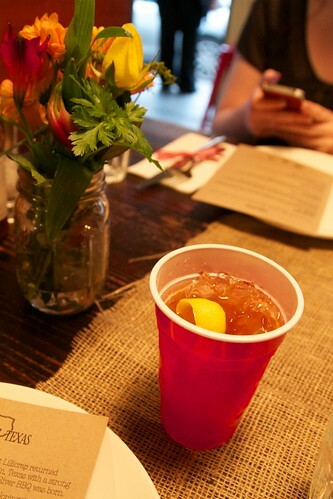 The tables had little cactuses with flags, and the cutlery was tied together with red and white bows. The atmosphere was electric with a big family function kind of feel; I particularly loved the Red River guys coming around with the trays of seconds. Everyone was just so excited about the event, and it made the food taste even better. It was the buzz. It was was the BBQ sauce. It was the vibe. I just enjoyed all of if. Absence makes the heart grow fonder, Texas. 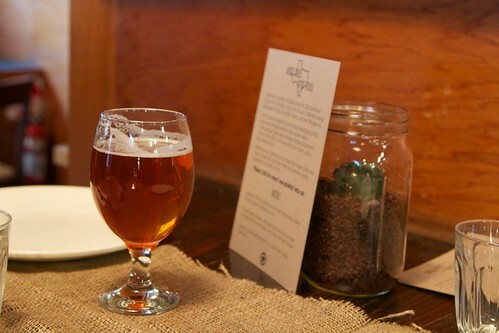 There was a set menu for the event, we just ate what we were brought, and we loved it all. 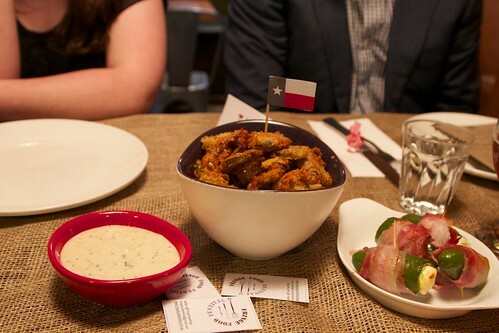 There were 2 entrees, fried pickle chips with ranch dressing which were surprisingly awesome. I’m not a big pickle person, but there’s just something about combining slices of pickle with batter and ranch dressing, these chips were far more than the sum of their parts. Next up were cream cheese stuffed jalapenos wrapped in bacon. These were also pretty good, although the heat of the jalapenos really varied, dangerous! 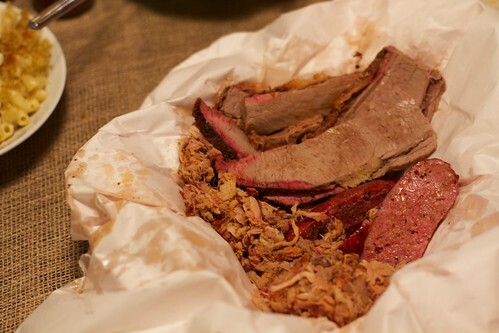 Mains was an amazing paper wrapped package of texan sausage, pulled pork and brisket. It was all great, I can’t even say which one I liked most. What I did like though was that just when we were finishing up the Red River BBQ boys were walking around with a tray of left over meat offering people seconds. That’s something I can get behind. As well as the meats there were 3 sides. 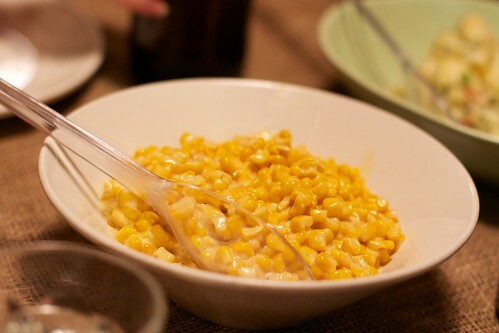 The first was creamed corn. It was the creamiest corn I’ve ever eaten. 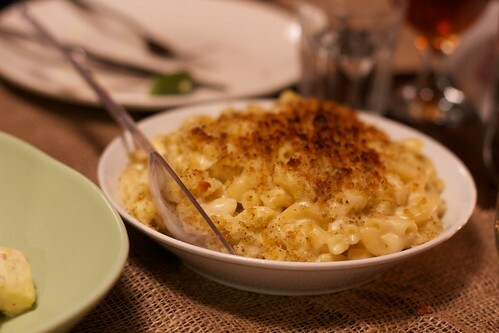 Next up was my favourite non-meat part of the meal – the mac’n'cheese. Seriously. Amazing. After eating it my friend PE just sat there nodding and saying ‘this is good’, doesn’t sound like much, but that’s high praise. Meanwhile I was just sitting there grinning at no one in a cheese induced happy coma. The last side was the potato salad. 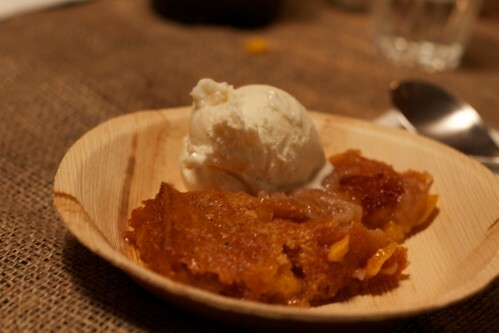 For dessert they served up a peach cobbler with vanilla ice cream. It was also delicious. Thinking back I don’t know how I managed to eat it at all given the size of my brisket baby, but I’m so glad I did, this was a cobbler worth making room for. I think the next 2 BBQ nights (29 March, 19 April) are sold out, but there’s a wait list and if you know what’s good for you, you’ll get on it. Now. This entry was posted in Eating out and tagged BBQ. Bookmark the permalink. Trackbacks are closed, but you can post a comment. Thank y’all for coming along – I am SO thrilled you enjoyed it! Thank you so much. 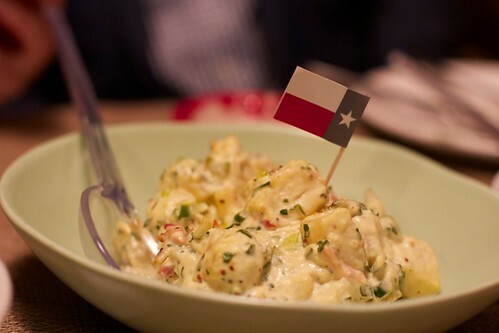 I’m really glad that our passion for fun, entertaining evenings shone through as did Burger Mary’s love of texan BBQ. I want more fried pickles though! The fried pickles were surprisingly good! Congratulations on a great night, can’t wait to come along to more in the future. I was there too! Amazing! And that was the first time in a long time that I’ve gone home from a night eating out and felt absolutely stuffed! I normally walk away from even 10 course degustations still hungry! Went last night. Just Awesome! Love that Pie! Great right? I think the mac’n'cheese was my favourite non-meat part of the meal though. I wish I could have gone again!